There are two pretty important gunshots that bookend “A Single Shot,” though the title is a reference to the first one. 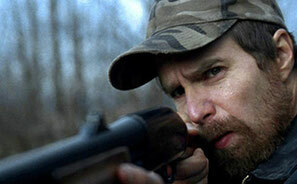 It’s taken by John Moon (Sam Rockwell), a weary, unemployed man estranged from his wife and son and living in a rusting trailer in the backwoods of somewhere. The location is never specified, but accents and colloquialisms suggest Appalachia. Based on the book of the same name, also by screenwriter Matthew F. Jones, the film isn’t shy about its aims of literary tragedy. The results are an atmospheric misfire – an uninteresting mix of the much better “A Simple Plan,” “Winter’s Bone” and a dash of Cohen brothers. Rockwell commendably portrays John’s forlorn routine of poaching wild game out of season on private property while pining away for Moira (Kelly Reilly) and their toddler. He holds on tight to his hopelessness in the wake of the unfortunate shot that drives the plot, refusing to sign divorce papers and blind to any opportunities that arise, including a job offer from farmer friend Cecile (Ted Levine) and a potential romance with Cecile’s cute and capable daughter Abbie (Olivia Lovibond). But back to the shot. Walking through the fog – of his general malaise and that of a misty forest morning – John treks into the haze with his shotgun, tracking a deer. Hearing a rustle in the bush he turns and fires, hitting and killing a teenage girl hiding out in the woods. After becoming literally sick over what he’s done, John has the wherewithal to drag the girl to her makeshift campsite and stage the scene to suggest a suicide. In the process he finds a big red box full of 100-dollar bills. 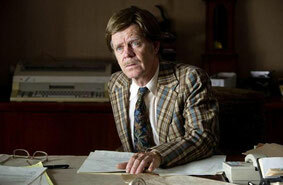 Soon thereafter John gives a wad of cash to small-time small town attorney Mr. Pitt (William H. Macy) to help with his divorce proceedings. Macy’s Pitt represents some of the misplaced labor put into the meaningless details of the film. He has a used car salesman plaid suit, terrible toupee, pronounced limp and paralyzed arm – a clumsily forced caricature lacking in depth or meaning. When jerkwater ex-cons and other undesirables start circling, John’s world begins to close in. He gets threatening calls and notes. His dog is shot. His old buddy Simon (Jeffrey Wright) appears offering moonshine and women, but seems more interested in searching John’s trailer. As he has a propensity to do, Wright throws himself fully into his role perhaps a little too confidently. In a would-be pivotal scene that kicks off the final act, his scruffy beard, shabby clothes, lip full of tobacco and drunken stupor provide him the inspiration to mumble his lines so unintelligibly there’s no possible meaning to derive other than contrivance. What’s intended to be a monologue about the history of the cash at the center of the dilemma turns into a school in awkward overacting. Cliché imbues all of the satellite characters with a hokey menace that belies director David M. Rosenthal’s desired somber tone. The drug addled Obadiah Cornish (Joe Anderson) is an amalgam of every hick convict you’ve seen in film mixed with a guy that wandered onto the set after being caught on camera for the latest episode of “Cops – West Virginia.” As the even more fearsome Waylon, Jason Isaacs is saddled with a black jacket, black jeans, black hair, black beard look that doesn’t allow for much nuance. Both of these actors can be extremely effective, but with limited time are lost in the muck here. It’s also never clear why the slow burn of this noirish drama is so slow. In other better movies there are reasons for players (even unsavory ones) in the game to keep their mouths shut or wait to take action. In “A Single Shot” the heavies display no level of decorum or intelligence to prolong the proceedings. It’s quite clear everyone knows to a degree what happened and who has the money, but we have to wait two hours for a climax that could’ve happened before any threats, before any dogs were shot, et cetera. Rockwell brings the goods as a simple, wounded man wracked with guilt navigating a dreary landscape; the problem is the landscape that can’t get its arms around rambling plot points that try to add a lived-in feel but only dilute the drama. Another layer of strange sensibility is added through a string-heavy score from Atli Orvarsson that would be more at home in B-horror film than a subtle thriller. Less than the sum of its painstakingly manufactured parts, “A Single Shot” grinds to an overly-poetic finale that works in theory but not reality.